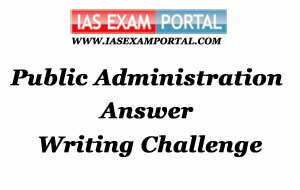 Weekly Mains Exam 2016 Answer Writing Challenge - Public Administration "MODULE- 48" | IAS EXAM PORTAL - India's Largest Community for UPSC Exam Aspirants. Weekly Mains Exam 2016 Answer Writing Challenge - Public Administration "MODULE- 48"
Public Administration- Paper I "Syllabus Topic – Administrative Thought : Weber's bureaucratic model – its critique and post-Weberian Developments"
Q1. The ideal type of bureaucracy is held by its proponent to be the most efficient. Do you agree ? Q2. "With the Creation of new regulatory agencies in the wake of liberalisation , overlapping jurisdictions and conflicts become the new trend. Is there need for the creation of a Super - regulator or unified regulator ?" Liberalisation has brought rapid economic and social development in India .The fast paced modernisation is accompanied by various challenges in a number of sectors such as finance ,infrastructure, environment ,oil and gas to name a few. The creation of sector –specific independent regulators comes in wake of tendency to address sector specific challenges and to ensure best interest of consumers. However the conflicts between these independent regulators mostly due to overlapping jurisdiction have been in recent news. 1. Recent conflict between RBI and Competition Commission of India over merging failing banks with banks registering growth.The former considered the step in best interest of nation’s financial health while later opposed the move on ground of violation of principles of competition. 2. Conflict between Competition Commission of India and Central Electricity commission board over the’ abuse of dominance’.The Electricity act 2003 states that an ‘appropriate commission’can issue direction to a generating company if it abuses its dominant position or is part of a group likely to harm competition in the sector.Both the regulators disagreed over which is the ‘appropriate commission’. 3. Recently Delhi High Court stayed the CCI proceedings against three state Oil Marketing Companies on anti competitive behaviour in fixing the oil prices.The companies contended that CCI does not have jurisdiction over the issue as the Petroleum and Natural gas regulatory board is the regulatory of their sector. 4. Recent spat between Ministry of environment and forest and National Green Tribunal over granting green clearance is another example of conflict over jurisdiction. The procedural and jurisdictional ambiguities among different regulators have enabled stakeholders to search for the regulator which can best suit its interest,defying the whole idea of regulation. Regulatory convergence is necessary to avoid biases due to interpretation ,jurisdiction and ambiguity.The Regulatory reform framework should ensure independent and accountable functioning of each sectoral regulator alongwith addressing legislative ambiguity so that efficiency rather than delays are brought into economic activities. The best way to gauge regulatory convergence is to see if consumers’ interests are protected through better prices and quality, with wider choices, and if the producers remain efficient and innovative. A super regulator remains still as an idea as several regulatory acts have to be substantially amended for its implementation.